Trying to set up an LGB CS3 system on a layout that has a 3 way point and a double slip - the set up only has space for one address but both points use 2 motors. All of the instructions relate to Marklin products rather than the LGB 55025 etc. Do these points automatically take up the next address - if I numbered it as address 5, would I connect the 2 motors to the decoder output that are set as 5 and 6? You can connect two motors to one output, but they obviously both fire..
LGB 4-way point decoders, you set one address, eg. 1, 5, 9 etc. and the other three continue in sequence. The Massoth units, you can set any address to each of the four-ways, and they do not have to be consecutively numbered. I assume that if there are two motors on the 'slip', you could have a single decoder on each? Slightly Phil. The CS3 allows you to place a 3 way and a double slip as a complete track piece, but only gives you the option of selecting one address for it. I wanted to know if the second motor would take up the next address in sequence from the one you've just set in the that points setup on the screen. My guess, a 'feature' in the software..
Not had-at a CS-anything, to play with. But.. Can you 'add' a point decoder to the diagram, and assign it the next address?? I can understand a double slip being driven by a single point motor (it's common in the small scales) but surely a 3-way needs to have two independent tiebars? Possibly??? It depends on who has made it??? See post #, the LGB offering would appear so.. I would treat the 3YP as 2 separate points and allocate a decoder address to each motor. Sequential numbering on LGB decoders, 1-4, 5-8, 9-12, etc as mentioned by PhilP, but Massoth can be allocated any other. LGB did make an R3 (22.5 deg) 3YP in the past? Very rare, but I do have one! You have missed the detail in the question Gizzy. His CS3 only allocates one address to the unit. How, using a CS3, do you drive two motors on different addresses. I think we need a CS3 user to help here. Good point, well made Alan. "chip in"? is that a DCC joke? I'm sure we have the capacity for that sort of thing. Potential replies will be along soon, no doubt? This question piqued my curiosity so I decided to check it out. I don't have any 3way switches. I used two standard EPL turnouts to test how the CS3 operates with a LGB 55025 Multi-decoder. This Multi-decoder was labeled "B" when I added it to the system and has DCC switch decoder addresses 5-8. This happened to be my system's second switch multi-decoder. 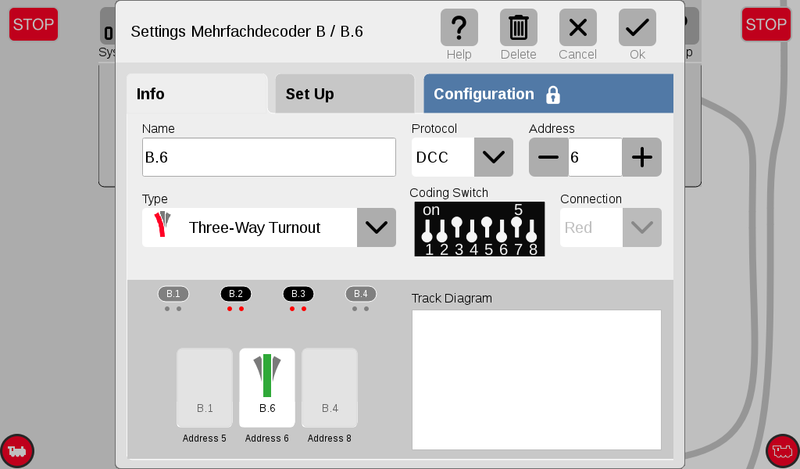 The following screenshot shows the Multi-decoder's configuration after adding the 3way. I added it to address 6 just to see what would happen. The system also automatically assigned the next adjacent address, 7, to the turnout. Thus, two addresses are allocated for the 3way's two EPL drives. Address 7, B.3 in the above shot, is no longer available to be assigned. Addresses 5 and 8 (B.1 and B.4) are unassigned in this example. 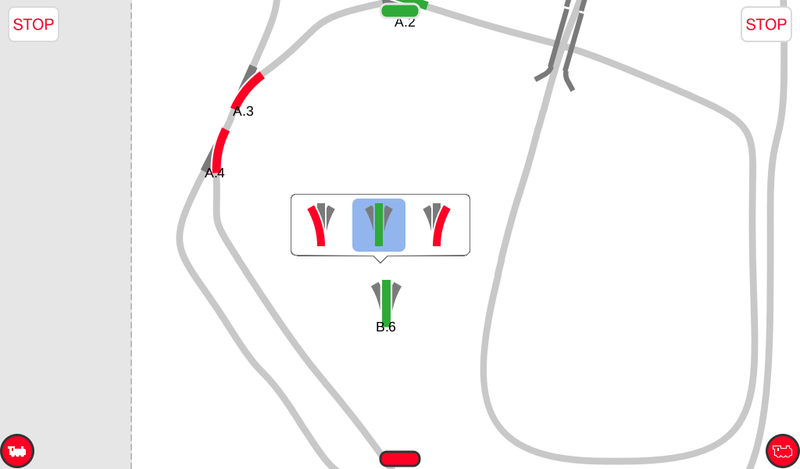 The next screenshot shows what you get when the turnout is added to the trackboard and the 3way is selected by touching it. 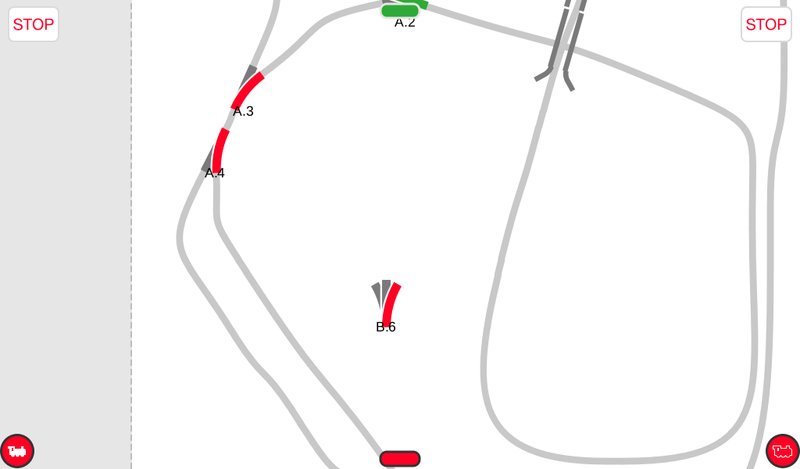 A regular turnout with a single diverging route immediately changes over when its icon on the trackboard is touched. A box opens that allows selecting from the three possible routes when the 3Way is touched. The currently selected route is highlighted in blue. Here it is shown as straight through. Touching either the left, center or right turnout icons will operate the two EPL drives as required to physically set the route and the box disappears. Note that on the trackboard the existing route is in color and the non-selected routes are grayed out. The next shot shows the right-hand route selected. One more note on the setup. I needed to physically swap which EPL drive was connected to which decoder output, address 6 or address 7 and also reverse the White-Orange leads on one drive to get the physical turnouts to mimic the trackboard setting. You will probably need to do similar fiddling with your decoder - EPL drive connections to get your 3-Way to behave correctly. It works great and completely as expected once the wiring is sorted. I did not try to see what happens if the last address of a multi-decoder is assigned to the 3-Way or whether the turnout can be assigned to two individual LGB 55524 Switch decoders. Maybe in the future. Edited to hopefully add more clarity. You can make 2 switch motors work from one decoder. To do this one must use the 12070 DPDT add-on unit. Wire it up so only one 12070 will work at a time by using the other EPL to select it and visa-versa.